You may have recently observed a lot of discussion on the internet about brushing and whitening teeth using charcoal products. Over the past year, we have had many patients inquire about the effectiveness and safety of using charcoal on their teeth. History shows that many years ago, ancient Romans used charcoal powder in making a paste to clean their teeth. It was used in the 19th century as well. Currently, charcoal is showing a resurgence in popularity as a dental aid. The most common forms are charcoal toothpaste or a charcoal powder into which a wet toothbrush is dipped. While using charcoal for a period of time might lighten the teeth, it does come with risks. Charcoal is abrasive and can wear away tooth enamel. 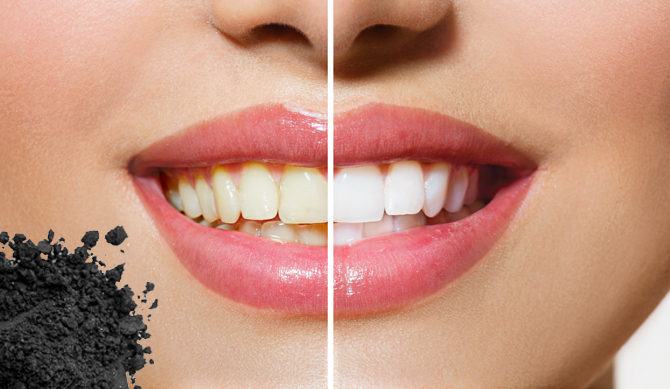 So even if you are able to whiten your teeth initially, the results might be short lived. As tooth enamel wears away, what becomes more prominent, is the underlying tooth structure which is yellower in color. Also, as enamel erodes, your teeth can become more sensitive to temperature and to certain foods and drink. In fact, the American Dental Association has stated that activated charcoal is abrasive and its usage can lead to enamel wear. Before incorporating a new product into your hygiene regimen, it is best to consult your dentist who can make you aware of risks and safety issues that the general public might not know of.